Photograph of Paul Smith's Hotel. 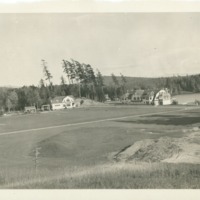 Caption: "Paul Smith's after the hotel burn - L to R - Smith's Cottage, Gas Station, Store, Cottages #2 and #3 re-located (in the distance) appears Jones Cottage is gone (see map) - #2 Greene #3 McAlpin - The Casino." “Paul Smith's Hotel 11,” Paul Smith's College Historical Photographs, accessed April 22, 2019, http://archivesphotos.paulsmiths.edu/items/show/2136.